In the spirit of summer, I have decided to do this month’s blog on a burger joint that is located Up North on the Lake Michigan shoreline. 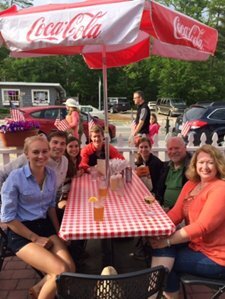 I recently went on vacation with my family up to Glen Arbor, Michigan and couldn’t resist a trip to Art’s Tavern. My family has been going up to Glen Arbor for years and one of the main stops for every trip is Art’s. Art’s is a neat little restaurant located in the heart of Glen Arbor. From the outside, the restaurant doesn’t look like much but when you walk in the atmosphere is spectacular and the staff is always welcoming. On the ceiling you will find college/university pennants from all over the nation, spanning across the room. Art’s has a great menu, offering breakfast, lunch and dinner and of course BURGERS. The burgers at Art’s are all delicious and won’t leave you hungry. If for some reason none of the burgers on the menu catch your eye, they usually have burger specials each day of the week. For my latest trip I decided to order the classic Art’s cheeseburger. This is just a typical cheeseburger topped with lettuce, tomato, and onion but man is it tasty! They offer a range of burger choices and all of the ones I have tried (most of them!) have been delicious. I would highly suggest heading to Art’s Tavern if you find yourself hiking up the Sleeping Bear Dunes, lounging by the pool at The Homestead or just browsing the shops in Glen Arbor.